Thank goodness for Minibar. With The Jayhawks gone, it's good to see another quality band continue to produce great alt-country pop music. 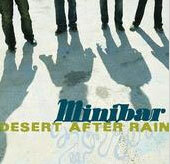 Earlier albums like "Road Movies" and "Fly Below the Radar" established Minibar as a solid rock band with some country leanings. This albums is where the group matures and it's a joy to listen to. Lead singer Simon Petty evokes Niel Young and Gary Louris with a vocal tenor and emotion that resonates similar to Eddie Vedder. The Byrds-styled guitar work from Tim Walker is also outstanding and would make Roger McGuinn proud. Great tunes here include "Things I left behind" and "Wide Open" with great melody and harmony similar to Del Amitri. "The Sight of You" has a nice West Coast styled flavor is my favorite song here. The mellow mood of the entire album seems to be just right, and until my Wilco album arrives later this month, I can get my fix here. Listen to some tracks on MySpace.